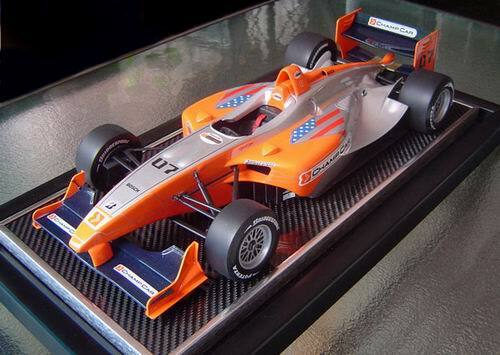 The Champ Car World Series, Speedgear, and Brinkworth Model & Design Consultants Ltd. 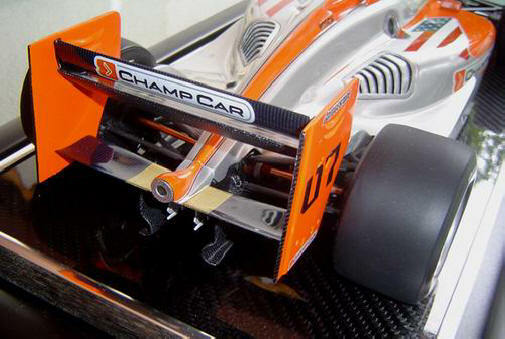 The decision to merge "Champ and Indy" in 2007, may well have been a good one for the racing community and fans as a whole, but our small business took a very heavy blow when the DPO1 chassis was discontinued, prompted by that decision. The original agreement, and our understanding, during development of the DPO1 models, was for the race teams to use the DPO1 chassis for at least three years. Unfortunately, that was not to happened. 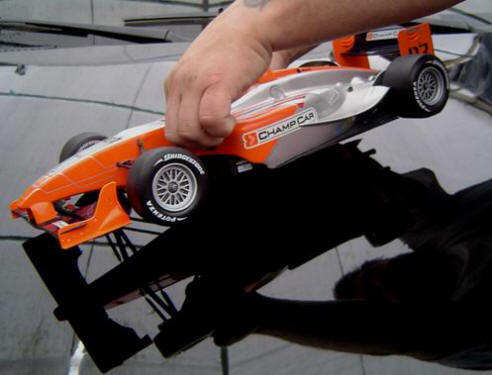 The decision to discontinue production of all our "Limited Edition" scale models, was a direct result, of that "Champ Car" action. 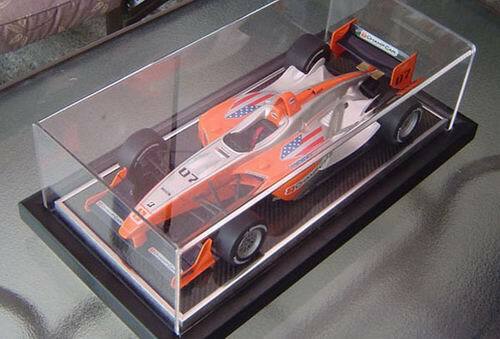 These picture will help to illustrate the actual size of our 1:10 Scale Champ Car model. A really good view of the very complex rear end of the DP01, showing the distinctive shape of the wing surfaces. Base Size 23" x 12".ee334 The height, from table top to top of acrylic cover is 7.5"
This particular colour scheme, called for many parts of the car like the front and rear wing surfaces and brake scoops, to be clear coated only, which left the carbon fibre texture exposed. Each individual team of course had their own paint scheme, so on many of the team cars, these surfaces were painted in the appropriate colours, as determined by their specific livery. The artwork for the sponsor's decals were produced in house, by our art department. 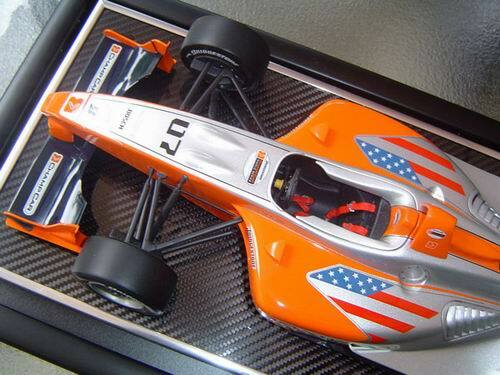 the criteria for the specifications of our 1:10 scale Limited Edition models, was determined over 15 years ago. It was decided that nothing would move, or lift off, to expose inside detail, (except the clear acrylic cover). It had to be large enough to look impressive, but small enough to be handed by one person to another, when being presented in person. It had to be in a scale of it's own, so as to distinguish it from commercially available die cast 1:18, or 1:8 plastic kit models. It was not intended to be a highly detailed model, with body panel lines which only tend to take away from the sleek lines of the car. It was however, very important that the livery and decals were interpreted very accurately, and the finish was to be immaculate, creating a piece of beauty when displayed at the office or in the home. It had to be a completely hands-off, under glass model for it's own protection, and we worked to those same guidelines on every single Champ and Indy car that we ever made. simulated carbon fiber was fitted to the interior of the cockpit along with a detailed steering wheel and seat belts, but no driver in this car.